Why do some marriages thrive while others merely survive? After nearly two decades of studying human behavior and coaching couples, we stumbled upon a transformational truth. The catalyst to a truly happy, thriving marriage. Surprisingly, the answer is quite simple. 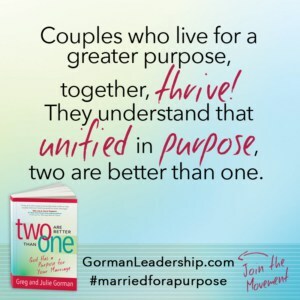 Couples who live for a greater purpose—together—thrive. Since the creation of Adam and Eve, God ordained the union of man and woman as the crowning jewel to His creation. His first intention for a husband and wife, as recorded in Genesis 1:26, revealed His BIG IDEA for marriage. [i]God’s words, revealed a purpose that required Adam and Eve’s interdependency- physically, emotionally and spiritually. And, since creation, God’s intention for a husband and wife hasn’t changed. So, what does He desire? What is His intention for marriage? What is the secret that truly makes the difference in relationships? Simply this—relationships that thrive embrace the central truth that God created each of them individually, for a distinct purpose and then hardwired them lovingly and masterfully for a distinct purpose, only the two of them will accomplish, together. God desires for you to live purpose-focused NOT problem-focused. The truth is God created you distinctly. He destined your spouse for a unique purpose. And, when the two of you married, He designed a plan for the two of you to accomplish together. Like Adam and Eve, His plan for your marriage will only be attained by the two of you operating as one—physically, emotionally, and spiritually. As Christians, if we lack intentionality to do what is most important, we exhaust our energy planning for events and strategically coordinating projects to excel our career or the next thing on our “to-do” list. Without intentionality, we may fail to put our best foot forward in marriage. We begin to live ME-focused instead of WE-focused and drift into the pattern of living unto our problems instead of into our purpose. But, when we unify towards a common purpose our relationship thrives more naturally. When we grab hold of God’s big idea for our relationship—that two are better than one—our unity reflects the cooperative nature of the Trinity and brings God pleasure. As we bring God pleasure, we perpetuate more of Him in our relationship, and the more we perpetuate Him in our relationship, the more we live life as He intended. “God, how can we bring You pleasure in our marriage? The more a couple lives toward a unified purpose, the more they enjoy marriage and celebrate their relationship to its fullest. Like anything in life, there is power, connection, and unity when we share a similar goal and desired outcome. When we live purpose-focused, our relationship and servanthood is not drudgery—it’s life giving. And, God intended for every marriage to enjoy life, together, as one. His intention for unity and purpose stands true for every marriage. Just as there is no such thing as a Christian without a calling, there is no such thing as a marriage without a ministry. And, that ministry will be as vast and unique as God is creative. But don’t worry! Discovering your marriage purpose isn’t another exhaustive list of things you need to do; it’s more a celebration of who you are. Click here to learn how you can uncover God’s specific purpose for your marriage and develop new habits of thinking that foster life in your relationship. 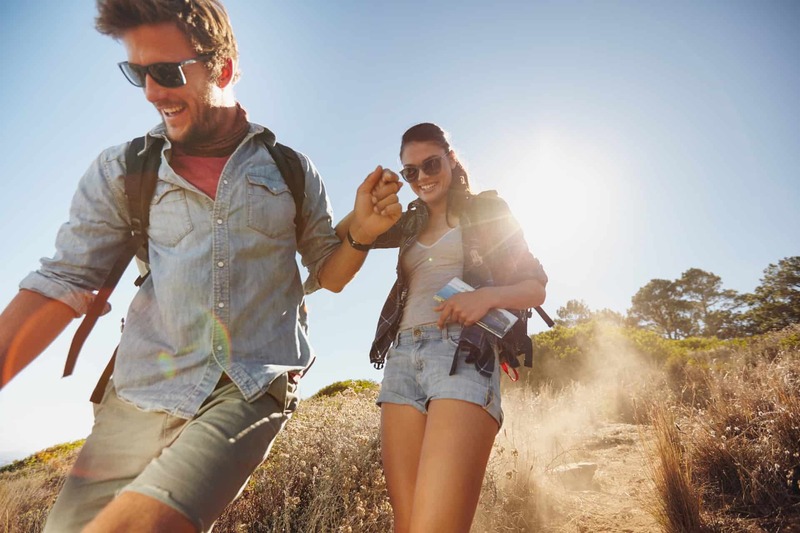 Or, take this free on-line quiz, to discover whether you tend to live more purpose-focused or problem-focused in your relationship. Also, be sure to watch for more upcoming articles from Greg and Julie Gorman.